Over the next two or three years, our healthcare system will be forced to undergo a fundamental transformation that will generate a great deal of mistrust and acrimony as 5% to 8% of total spending is removed. So how can your organization prepare for the real truth about the future of our health are delivery system? Trust will be key in the emerging environment of rapid transformation. In his book Trustworthy Government, David Carnevale describes trust as “an expression of faith and confidence that a person or an institution will be fair, reliable, ethical, competent, and nonthreatening”. Trust has also been explained as having faith that someone is able to, and wants to control their “dark side” as it would affect oneself or others. All too often, however, work organizations destroy their employees’ trust. Carnevale writes that many people go to work “with guarded, suspicious, and cynical attitudes. They have lost faith in their organizations. Their hopes and expectations have been mismanaged. The costs of mistrust and cynicism are high. These emotions corrode organizations and destroy high-performance. The loss of trust is a loss of system power in organizations. Trust is an integrative mechanism – the cohesion that makes it possible for organizations to accomplish extraordinary things. Trust is social capital. It reduces conflict, improves communication, eases cooperation, enhances problem-solving, reduces stress, enables people to realize more satisfactory relationships, amplifies organizational learning, an advances change. Trust is a positive mindset. It needs to be restored in organizations”. All organizations have behaviours and issues that are “undiscussable”. That is, everyone in the organization is aware of a recurring dynamic or situation that blocks individuals and the organization from achieving desired outcomes and reduces effectiveness. However, no one will openly discuss the situation, or even articulate its existence. The unspoken decision to ignore or pretend to be unaware of the undiscussable is reinforced the longer the tacit agreement of silence is maintained. Beyond the silos, within the power dynamics among the Health Link CEOs, and among the LHIN leadership, there are issues which everyone very carefully manages to avoid. People within an organization and within a delivery system begin to engage in what Chris Argyris, in his book Overcoming Organizational Defenses, calls “organizational defensive routines“. These routines are basically avoidance strategies. They are ways of by-passing errors, ignoring difficult issues and problems, and saving face (for yourself or a colleague). While defensive routines help us to feel secure and in control in the short run, they ultimately erode our sense of well-being and the health of the organization. By masking the dynamics of the situation, defensive routines keep undiscussables underground, and legitimize error and unacceptable behaviour. From his study of organizational defensive patterns, Argyris warns that the longer the situation continues, the greater the sense of malaise, hopelessness, and cynicism exists. The malaise leads to distancing and blaming behaviours, mediocre performance, and, finally, blow-ups at the individual and organizational levels which destroy the capacity for learning, efficiency and effectiveness. Surfacing undiscussables and exploring them without blame or defensiveness requires a great deal of courage and skill. Two exercises, “Undiscussables,” and the “Left and Right Hand Column” offer some guidance for teams seeking to unveil and learn from taboo topics. However surfaced, people find that undiscussables often turn out to be critical factors in solving problems, propelling them toward their vision, or developing their collective ability to learn. Over time, as more open communication develops within the organization, the fear, blame and judgment that feed undiscussables and defensive routines will be replaced with trust and a commitment to generative learning. “Telling the truth” will only become a common practice in organizations when there is a “safe environment” or culture that supports this norm. People need to consciously create safety for one another by being open to learning, and by their determination to “seek to understand”, rather than to judge. This concept is critical to the well-being of individuals, teams and organizations. I strive to “tell the truth” in my blogs. Often not “the whole truth” — because it is too often very negative. I try and explore positive issues and point to examples of success — while telling as much of the truth that I know. A fundamental commitment to the truth is a difficult way to live. It may set you free, but it won’t make you rich. Nevertheless, it is essential for authentic learning, empowerment, partnership and stewardship. By “commitment to the truth”, we do not mean that we are seeking the final word on an issue. There is not one external objective “truth”. Our understanding of reality is influenced by the assumptions, mental models and experiences that we hold deep inside. A commitment to the truth requires our relentless willingness to reflect on and surface the ways we limit or deceive ourselves from seeing the bigger picture. Continually being open to different understandings of why things are the way they are, demands that we practice honesty with ourselves. It also demands that we are honest with those around us. Constructive, honest feedback is essential for learning. Communicating anything less than the truth is a common defensive behaviour that is intended to protect ourselves or others. Like all defensive routines, however, deception and avoidance prevents learning and hinders human growth and potential. By committing to the truth, we are collectively able to let go of assumptions and mental models that have held us back, and open ourselves to learning. 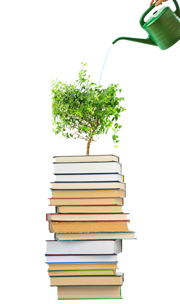 This “commitment to learning” and seeking the truth is intimately tied to an organization’s commitment to end secrecy. In his book, Stewardship: Choosing Service Over Self-Interest, author Peter Block states that organizations built on a foundation of empowerment support the idea of full disclosure. Arguing that knowledge is power, Block supports giving complete information and telling the truth all the time. This position requires “training all employees so as to create business and customer literacy. Full disclosure and full information are the rule, so that people understand the consequences of the decisions that they are making”. The number of “undiscussables” we have in the health system is really incredible. I openly question why MOHLTC was allowed to avoid the “will of the Legislature” that passed a law that enabled devolution of authority over spending. An example of an “undiscussables” is that MOHLTC failed to implement this provision of the law, in order to save/protect their own jobs. It has been estimated that 70% to 80% of MOHLTC jobs would vanish with devolution, and that modest growth and skills for allocating resources would be required in the LHINs. While the MOHLTC does not have veto power formally, nobody is stopping them. There is no devolution. Period. An “empowered organization” requires individuals who are deeply committed to the truth. Block’s notion of stewardship suggests that we hold in trust the well-being of some larger entity — our organization, our community, the earth itself. Block says that to hold something of value in trust calls for placing service, ahead of control. It means we no longer expect leaders to be in charge, or out in front. We search, so often in vain, to find leaders that we can have faith in. Our doubts are not about our leaders’ talents, but about their trustworthiness. We are unsure whether they are serving their institutions or themselves”. By modeling the values of stewardship, service and trustworthiness, leaders can steer their organization toward vibrancy and health and commitment to achieving the shared organizational vision. A “commitment to the truth” is also essential to establishing real partnerships within and amongst organizations. Block describes how traditional hierarchical structures based on uneven power relationships between bosses and subordinates make it difficult and unsafe to tell the truth. Bosses must pretend to know all the answers, since that is what is expected of someone in their position. In turn, employees must strive to hide mistakes and areas that could be improved — so as to avoid being blamed by their “superiors”. By redistributing power within organizations to create true partnerships, we are able to create an environment in which people feel less vulnerable, and are therefore more honest with each other. It can get even more complicated in structures like Health Links — which is a structure that requires CEOs who normally pull apart, to begin to pull together. To avoid one another, and to avoid the truth about the need for true collaborative action, many Health Link CEOs have simply turned over the responsibility for this little “pilot project” to middle management. They don’t intend to use Health Links as a platform to transform their system. The fact is that the effort behind many Health Links is mostly about the 5%, rather than how the CEOs will transform the design of systems, structures and processes — based on what they are learning from the 5% of high users. So, the truth is, many Health Links are compliant, but few are heading for transformation, but that itself becomes an “undiscussable”. No matter whether our concern is with learning, empowerment, stewardship or partnership, a “commitment to the truth” begins with deep personal commitments from the people at the top — senior management and the board. Block believes that what is true, is known to each of us — that we all have the knowledge and answers within us. He writes, “the spirit demands an inward focus,” needing reflection, dialogue and clarity about our own intentions. Looking externally at the commitment of others diverts us from taking responsibility for our own choices and actions. In his book, Trustworthy Government, David Carnevale explains the importance of participative processes for building high-trust, cooperative and high performance organizations. He writes, “participation elevates feelings of personal efficacy by granting staff more control over their work lives. Involving employees means trusting them with information, power, authority and responsibility. They interpret their enhanced control over the conception and execution of their work as expressions of confidence, and they respond accordingly. Trust is a reciprocal attitude”. FORWARD THIS BLOG TO COLLEAGUES WHO DON’T WANT TO WORK IN A SYSTEM THAT KEEPS THEM SMALL. This blog provides a thinking exercise about what we need to do to make our future healthcare system come into existence. Scroll down and read the left, and then right-hand column about our current reality in our first curve healthcare system, and about what it will be like when we achieve our vision of the future — when we reach the second curve healthcare system over the next three years. When you finish reading the right-hand column about what it will be like, your job is to think about what Leveraged Actions (maximum impact for minimum effort) would be required to propel us from where we are (current reality), to where we’re going (emerging vision). There are five key perspectives that must be considered when planning for a fundamental transformation: Customer/Patient/Citizen, Financial, Structural/Value-Creating, and Skills & Capacity perspectives. So, what would need to happen in order to propel us towards the emerging vision? FORWARD THIS BLOG ONTO ANY COLLEAGUES YOU THINK MIGHT BENEFIT FROM THINKING ABOUT THE TRANSFORMATION AHEAD. At the bottom of this blog is a chart that sets out the design of accountability in the LHIN/Health Link health service delivery system model for Collaborative Governance. In the Collaborative Governance Model, health service providers (HSPs) shift from their silos into a systems approach to governance and accountability. The Strategic Balanced Scorecard — the four-box framework that sets out the organization’s Board-Approved strategy — including the methodology for tracking progress. The Health Link Business Plans contain the newest set of accountabilities that Boards of organizations that have joined a Health Link must add to the other two sets of accountabilities. While the lead partner in the Health Link is accountable to the LHIN, each partner’s board, and their CEO, are accountable for achieving their part of the agreed-upon outcomes. 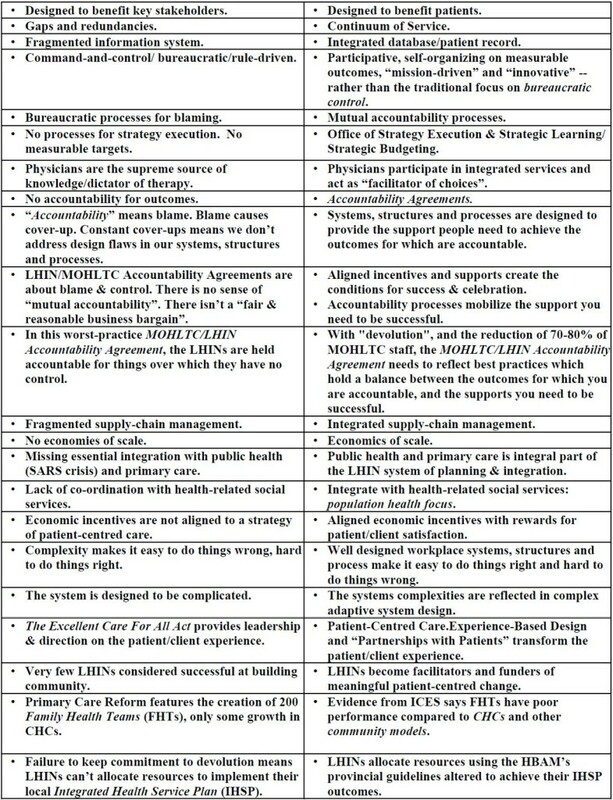 The chart at the end of this blog also outlines how formal Accountability Agreements between Boards and their CEOs (as well as Chief-of-Staffs in hospitals) reflect the input from those three sources: the internal organizational scorecard; the agreed-upon Health Link outcomes; and, the outcomes required in their Service Accountability Agreement with the LHIN and the local Integrated Health Services Plan. It shows how the CEO’s Accountability Agreement (and the Chief-of-Staff’s Agreement) drive both the Managerial Accountability Agreements, and the Medical Chiefs’ Agreement in hospitals. Best practices suggests that everyone’s accountabilities — and the “supports they require in order to be successful” — are explicit, fair and balanced. The Balance Governance Scorecard’s four-box framework can provide a method to check on the degree of alignment that there is in your system of cascading accountabilities. The chart below outlines the accountability architecture, from the perspective of a single HSP. From a “system perspective“, we need each of the HSP’s governance boards to hold their CEO’s accountable for each of these three perspectives. They are no longer just a silo board, they need to think and act like a “system board” on behalf of the whole community. The key assumption of the Collaborative Governance model is that Boards exist to represent the interests of the “owners” of the organization — not the narrow interests of the organization itself. 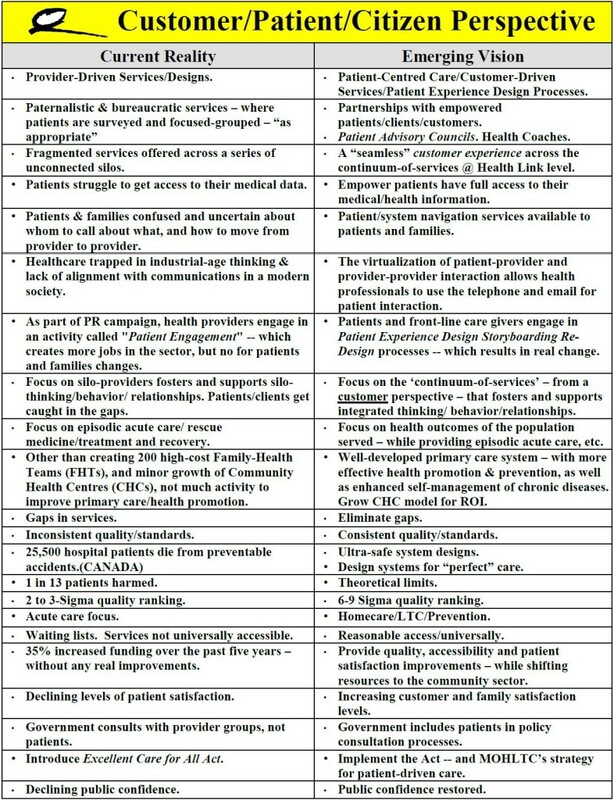 So, in addition to holding the CEO accountable for the outcomes in the Board’s approved organizational scorecard, a best practice Collaborative Governance Board would also monitor progress on the LHIN’s service agreement — as well as the appropriate components of the local Integrated Health Services Plan (IHSP); and, the agreed-upon business plan outcomes from their Health Link. That’s the basic architecture of the Collaborative Governance Model. For the most part, the people currently talking up the concept of “Collaborative Governance” really only mean that collaboration is a “good thing”. It’s a nice value, rather than an aligned pragmatic accountability system design for governance. In this simple worldview, collaboration is “good” and, as such, ought to be practiced. But the concept of “Collaborative Governance” must become more than just a “good intention” and a “nice value”, it must be intentionally designed and aligned to actually work to create collaboration at the CEO/Management/and at clinical levels — where integration really counts. Collaborative Governance needs to be intentionally designed to be an antidote to “silo governance”. It enables silos to be part of the network system. It is intended as a force for integration — if the Boards of Health Links partners would meet together periodically to ask the “wicked” and “probing questions” on behalf of the community: the “owner” of the entire healthcare services delivery system. When HSPs were just silos, governance boards only held their CEO’s accountable for outcomes in their silo. Today, a major feature of Collaborative Governance is that while Boards exist to ensure good management in their silo, as Health Link Partners, and as members in a common LHIN, they are equally and mutually accountable for improved outcomes in their local healthcare services delivery system as well. So in the future, Boards would hold their CEO’s accountable for both system-level, and silo-level outcomes. That’s the key leverage point for Collaborative Governance: the integration of system & silo accountabilities. It’s the traction that makes integration actually occur at the Health Link level without setting up yet another “super-board” to govern the whole local system. Nevertheless, Collaborative Governance needs to be much more than just a “good intention”. The “lead” Health Link partner organization has been entrusted with one million dollars of taxpayers’ funding to support the development of the partners’ agreed-upon action plan. Some of the more strategic CEO-led Health Links (vs. the more operational ones), will be developing Health Link Balanced Scorecards that spell out the “cause-and-effect linkages” between the Customer/Patient/Client outcomes; the Financial outcomes, the Process outcomes, and the Learning & Growth outcomes in their scorecard. As everyone will discover, when you’ve seen one Health Link, you’ve seen one Health Link. They are a real mix of relationships. Nevertheless, leadership surveys @ TedBall.com demonstrate a very respectable amount of optimism that Health Links will in fact succeed in their mission to transform their local delivery systems. While concerns have been raised that some Health Links see themselves as a pilot project for the Top 5%, rather than a structure to achieve better integration of services for the whole community — based on the “lessons learned” from the “Top 5% Group”, who consume 66% of all our resources. For organizational structures to succeed, they need to be designed and aligned to succeed. However, for whatever reason, Queen’s Park has failed to be very clear about the governance of Health Links, or about how accountability would work. Why? They believe that saying nothing about governance and accountability means they are promoting a “low rules” environment, and that people should feel free to innovate. So, without a macro-framework for alignment, it will now be up to the 80 individual Health Links to design and align themselves to work as an integrated health services delivery system. Collaborative Governance provides a framework and practices to enable alignment within each Health Link. The advent of Health Links as formal partnerships — with formal accountabilities — ought to trigger the governance boards of the Health Link Partners to get together — perhaps a couple of times per year — to review the progress being made together by “the partners” in the network. By bringing the Health Links Partners Governance Boards together to review their local delivery system’s progress; and to explore how the partners could transform the patient experience as they travel across the continuum-of-care; communities, through these boards, could be able to hold “stewardship” for the local health services delivery system’s transformation journey. As “stewards” for the well-being of their community, our governance Boards need to stretch their minds ahead to 2015 and beyond. They need to understand that there will in fact be significantly fewer resources available for healthcare services immediately after the election. Some organizations could face 10% cuts in their budget, while others will be required to manage rapid growth and expansion. There will also be a pressing need to re-allocate resources within the existing healthcare delivery system to meet the emerging needs of each unique community. Who is going to do that job? Governing boards would need to acknowledge that their CEOs manage in toxic, blame-oriented regulatory environments driven by fear and anxiety that starts at Queen’s Park and spreads throughout the healthcare services delivery system. Boards need to explicitly liberate their CEOs to be innovative and creative as healthcare system executives, and as the organization’s strategic and operational leader accountable for silo and system outcomes approved by the Board. The beliefs and convictions of Ontario’s health sector leadership was captured in the recent health issues survey @ TedBall.com during March Break. On the question of “Devolution Of Authority” (for allocating resources) to the LHINs, 30% of respondents said they were “very supportive”; another 21% were “supportive”; and a further 25% said they had “some support, with adjustments”. That’s 76% of health system leaders who want devolution. That’s a significant stance that should not be ignored. Only 13% of respondents were “opposed to the devolution of authority” to the LHINs. With the arrival of a new Deputy Minister in June, and the expected report of the Legislative Committee studying the original LHIN legislation, there is an opportunity to tag the LHINs with the task of re-allocating fewer resources across their delivery system using provincial standards and their Integrated Health Service Plan as guides. I very much doubt that the next government really wants to put Queen’s Park in charge of downsizing budgets at the local level — or in charge of re-allocating resources from acute care to community care, based on evidence and population need. That’s the point at which politicians say: shouldn’t the decision about the allocation of resources be a local decision, rather than a centralized bureaucratic decision? The emerging challenge for Health Link Partner Boards and their CEOs, is: how quickly they can prepare for major transformational change over the next year or more — while funding still remains somewhat stable — as long as we are in “pre-election mode”. While the next election could actually be as far away as a year from now — and perhaps even to the end of the legislated mandate in 2015, people who have been “putting things off until after the election”, should be asking themselves: why are you waiting? Are you a political candidate, or a healthcare leader? So, now would also be a good time for Health Link Governance Partners to engage in conversations about Collaborative Governance design — before the financial crunch comes after the election. Smart people, smart communities will be getting their ducks in a row now. Unfortunately, many LHINs and Health Links may actually wait until their community is in a horrible crisis before moving to action. Some will hold true “stewardship” for their community, and take action much earlier. Today, perhaps 20% to 30% of our healthcare delivery system has actually achieved a state of “readiness for transformation”. There are a number of LHINs that are currently already engaging their HSP governance boards about governance, and about the concept of Collaborative Governance. But given that 70% of all major large-scale change efforts fail, it is very possible that only 30% of our Health Links will actually succeed in the end. That may be the case in some LHINs. There are mixed reports on the behaviors and operating assumptions of our 14 LHINs. Respondents to our recent March Break Health Leaders’ Survey had a distinct pattern. 40% said they had “little” to “no confidence” that LHINs would contribute to the success of the Health Link Program. That is a significant level of negative judgment about our existing LHINs, and their capacity to support transformation. 32% of Ontario healthcare leaders said they have “some confidence” that LHINs will help the Health Links initiative to succeed. 28% said they had “high” to “great” confidence that these local integrated health systems would succeed. That’s 60% who have some degree of confidence that LHINs would help the Health Links succeed. 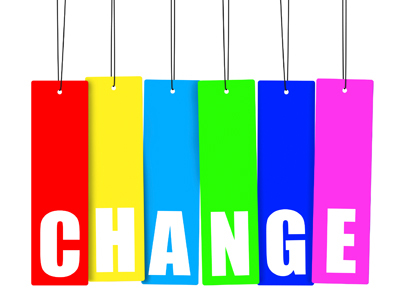 Form a change management perspective, that’s a solid critical mass going forward. 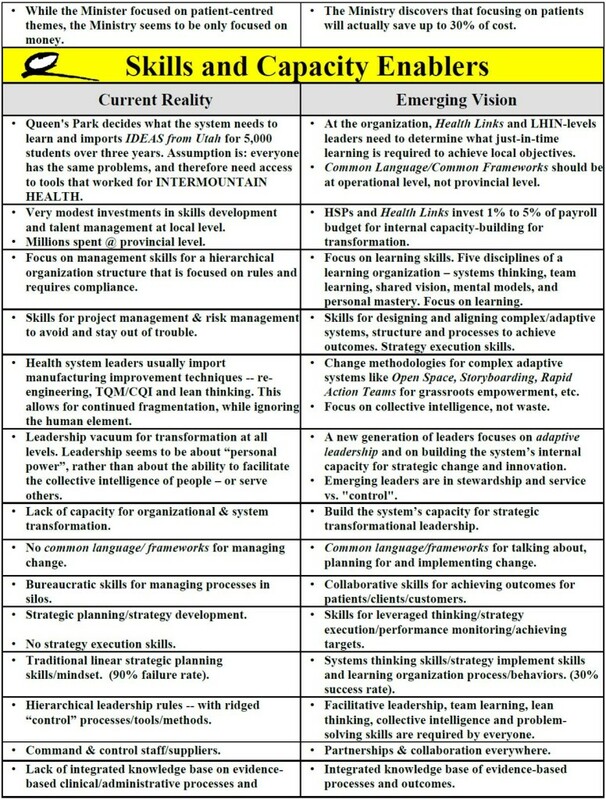 But if Health Links are to become the “transformational” vehicle that Queen’s Park claim they are, the partner CEOs and senior managers need to be liberated by the governors to develop the strategy and a plan for aligning the structures, culture and skills of the partnering organizations to create a better more seamless experience for patients. If every Board told their CEO that among their highest priority is the creation of a “seamless experience” as patients and their families move across the continuum-of-care in their community, we would achieve the integrated system taxpayers are demanding. The foes of local governance say that these silo-boards are in fact urging their CEOs to build a self-serving empire at each organization. That could be true in 10% to 15% of “old-school cheerleader boards”. Today, in addition to each Board holding their CEO’s accountable for system and Health Link outcomes, Collaborative Governance design could also include an aligned structure for regular quarterly meetings of Health Link Board Chairs/Vice Chairs in order to review the overall Health Link Scorecard, and to engage in generative dialogues on high-level strategic directions for the Health Links Partnership. Notice I’m not advocating for a new layer of Health Link System Governance. Collaborative Governance is about the self-organizing capabilities of systems. It is not about new structures. It’s about new conversations, and new behaviors. Of the three governance modes of Strategic/Fiduciary and Generative, the Collaborative Governance Partners’ Council needs to focus primarily on being “generative“. On behalf of the “owners” of our healthcare delivery system, they should invest perhaps four days per year asking “wicked” and “probing” questions that will help management uncover the strategic directions required to achieve the vision for a more integrated delivery system, that improves the patient experience, and achieves the goal of improved health status of the population served. Health Links need to become learning communities, and the governance boards need to play a role in facilitating learning, in their organizations, and across the sector. 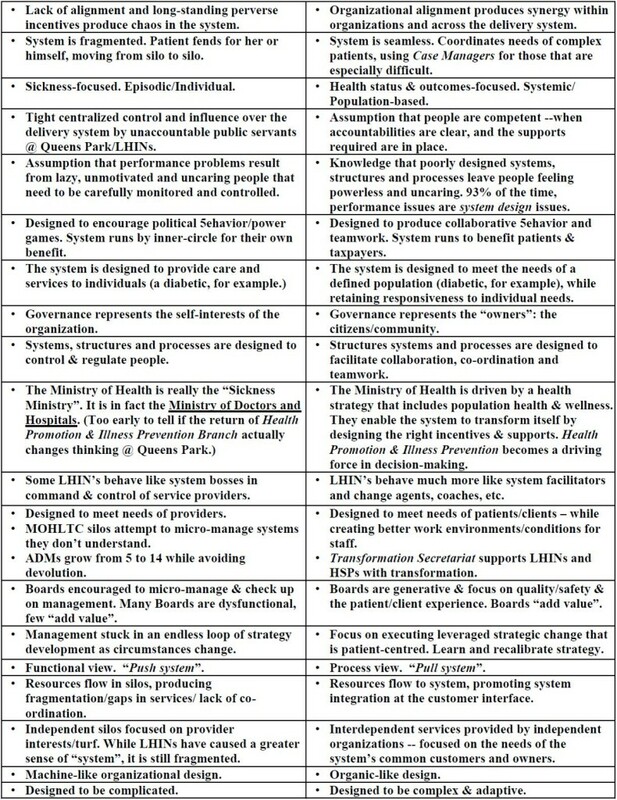 The challenge: Queen’s Park seems to be totally perplexed by governance and best practice governance concepts — including their own incredible track record of actually implementing “worst practice” governance models at the Family Health Team level. In addition, a number of key people in the Queen’s Park inner-circle of policy influencers are “anti-governance”. This is the “Fewer Boards are Better” camp. The “fewer boards are better” advocates apparently do not accept the research from Canadian Patient Safety Institute (CPSI), and from Institute For Health Improvement (IHI), that suggest that properly trained governance boards can actually add significant value towards improving health quality, patient safety and the patient experience. The anti-governance advocates don’t acknowledge these points. They simply say that silo-governance causes system fragmentation. They say the solution is to just “get rid of them”. As always, there is some degree of truth in the anti-governance group’s charges. Some governance boards — particularly our Health Science Centre Boards, and sometimes boards of smaller hospitals — do push their CEOs to be silo-centric, rather than system-centric. All the Minister of Health, (or even the LHINs) need to do is “call them out on it”, when Boards are being silo-centric. So far, this anti-governance sentiment has only manifested itself as neglect from Queen’s Park. The problem is, if Health Links fail because there was not a best practices approach to governance and accountability, who will be accountable? Would that be the Minister’s, or the MOHLTC’s responsibility to ensure that the program they designed actually works? The answer is: it’s both. While these are still early days, we are now entering into our second year with the Health Links program. What are we learning? What’s working? What’s not? The best current examples of emerging Collaborative Governance in Ontario is at the North Simcoe Muskoka LHIN — led by Board Chair, Bob Morton; and at the SELHIN, led by Board Chair, Donna Segal. People should access their slide deck presentations from their upcoming April 28th OHA Workshop presentations to understand their respective approaches to Collaborative Governance. While these slide-decks outline the logic of the approaches being taken by the NSM LHIN and by SE LHIN, the glue that actually holds their process together is trust, ownership and commitment. Trust enables true collaboration, and, with practice, synergy. In the Collaborative Governance Model, if Board Chairs, Vice-Chairs and Committee Chairs of Health Link partner boards were to meet three or four times per year as the HSP governors, they could monitor the systems’ evolving progress, and explore potential leveraged actions that would propel the whole system forward — the wonderful world of continuous improvement and strategic learning. We have yet to get accountability design right in our healthcare system. 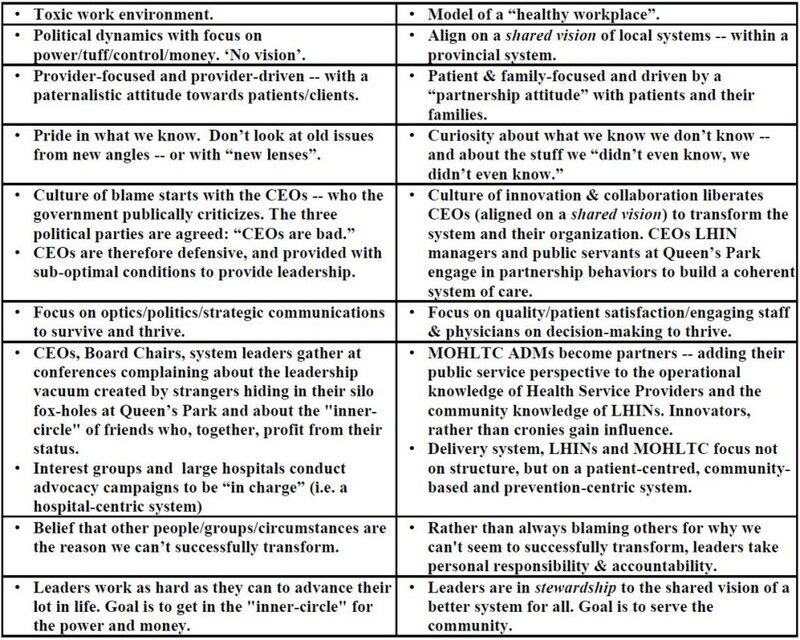 So, in this “low rules” environment — where government has no clear views on governance and accountability for Health Links — health system leaders should take some time to think about it: how could your organization better integrate the multiple outcomes for your organization — and for the larger system at the LHIN and Health Link levels? Think about it as you review the chart here: Collaborative Governance: Accountability System Alignment. FORWARD THIS BLOG TO COLLEAGUES INTERESTED IN THE ART & SCIENCE OF ACCOUNTABILITY ALIGNMENT, AND THE NEED FOR DESIGNING COLLABORATIVE GOVERNANCE FOR HEALTH LINKS AND FOR LHINS. The new vested self-interest group in town is called “Patients Canada” – the newly-transformed Patients’ Association of Canada, headed by their wise and thoughtful President, Sholom Glouberman. Patients Canada is the product of the learning done by hundreds of people engaged in generating “patient stories” and deeper insights into the patient experience over the past four years. Glouberman has attracted a clump of highly talented people skilled at developing things like patient satisfaction/patient experience indicators. He also meets with governmental officials, and healthcare service providers, to explain: “what patients want”. “We know the system will be changing dramatically over the next few years. We’re simply saying the patient perspective needs to be at the table as the new system is designed”, says Patients Canada‘s President. “We’re interested in improving the healthcare system, and we’re interested in working with providers to do that. We don’t see ourselves as an isolated group arguing only for the patient perspective”, says Glouberman. His point: when patients win, everybody wins — healthcare professionals, administrators, boards, politicians, taxpayers. “The most critical system change that needs to happen is the development and provision of health and social supports required by a rapidly growing population, with the various stages of chronic diseases. And the greatest savings we can make for this population is to provide support and treatment for them and their caregivers at home — in order to avert hospitalization or institutionalization,” says Glouberman. Recent studies show that about 40 percent of people destined to go into very expensive institutions can be maintained at home — which would of course be of greater benefit to seniors’ physical and mental health. While “aging at home” is often perceived as an option only for the wealthy, it is actually more cost-effective: the cost of homecare services for one day averages out to $55 compared to $1,000/day for a hospital bed, or at least $130/day for a long term care bed. Along with Glouberman and Decter, Dr. Vaughan Glover, the President of the Canadian Association for People-Centred Health, also pushes for a very different kind of healthcare delivery system. Nevertheless, despite very clear messages from Decter/Glouberman/Glover, we still seem confused about what to do in a system that is bloated with data, but starved of wisdom. So, just where is the community health services development vision that will guide the shift from acute care to community and primary care at either the provincial or local level? There are no such comprehensive plans to my knowledge, and there does not seem to be any pragmatic focus on developing the capacity of the community sector to expand to meet the challenges of our seniors population. As long as shifting from acute care, to primary care, as the “hub of the system” is just a talking point in the Transformation slide-deck, the status quo is not in danger, if they just can keep everyone talking. That does not mean we are doing nothing. We are doing “stuff”. But it is mostly unleveraged and underwhelming. 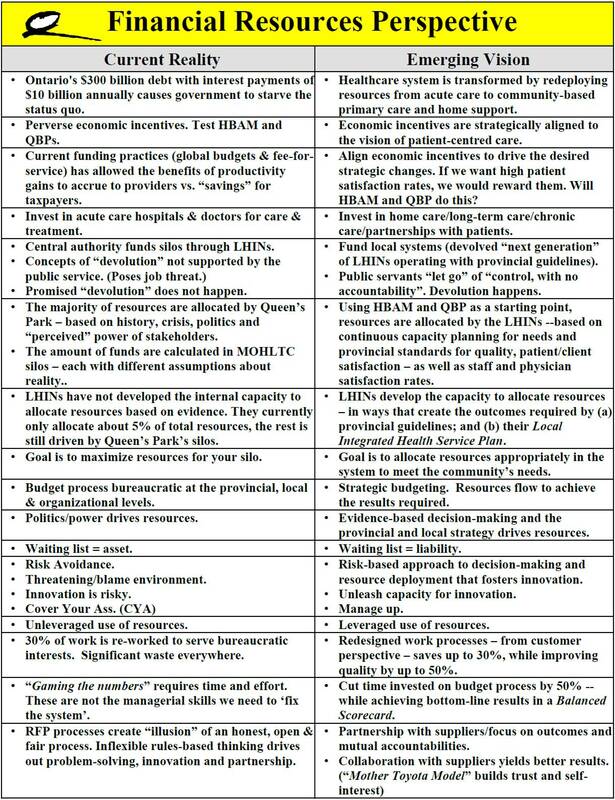 The MOHLTC continues to focus their energy and attention on the “one-size-fits-all solutions”, like the Ideas From Utah Program, and by seeking the views of the traditional vested interests power groups that I have named in my blogs on Queen’s Park (i.e. the OHA, OACCAC, AOHC, RNAO, the OMA). That’s not a negative comment about the Wynne Government. All governments — from all political parties — seem to dedicate themselves to protecting the status quo. I don’t know why, but they do. People who were kinda hoping that Health Links might cause the unleashing of innovation at the local level, are now reporting that numerous HSP CEOs don’t really seem to see this as an opportunity to “transform the delivery system”. That’s not an agenda that they have truly embraced at this point. They see Health Links as a one-off pilot project about the top 5% of users. They are not working to transform the system. They think all the hype about transformation is mostly just bunch of gobblygook from babble-speaking insiders who profit from reform rhetoric. “This too shall pass,” say the long-timers who have learned how to fake compliance. While MOHLTC officials tend to get caught in the interest group’s various lobby campaigns, they ought to pay very close attention to what the Minister is saying. The Hon. Deb Matthews, currently under pressure from a ground-swell of unhappy clients and staff of the CCACs, has branded herself the “Patient-Centred/People-Centred Health Minister“. Her leadership on this strategic theme is having an impact as many health service provider organizations scramble to become more “patient, and people-centred”. It’s clear this is her passion. By selling the concept of “patient empowerment”, the Minister has also paved the way for a “new voice” among the interest groups. The Minister of Health has made a revolutionary suggestion. She suggests we ask the patients what they think. But this is a big complex game. No doubt there will be new jobs for Directors of Patient Engagement — just like there were Directors of TQM/CQI in another buzz-word era. But will any of this PR rhetoric from MOHLTC result in any improvements? Is it possible that the patients could win? Patients Canada and its dedicated bank of talented volunteers are stepping up to change the existing DNA of our healthcare services delivery system. They have put together a brain-thrust to develop the essential set of patient indicators — which will no doubt be adopted as the accepted standard across the province, much like Ottawa Ankle Rules. But will they win? I sure hope so, but those fires of self-interest burning all around us are now clearly out-of-control and largely ignored by a critical mass of very nice leaders who continue to hope that it will soon be their turn in the inner-circle and the “big bucks”. While those who have power and money can be expected to be aggressive in their efforts to maintain the status quo, it’s actually too late. The bottom-up consumer revolution has arrived on the shores of our teetering healthcare delivery system. Bye, bye status quo! FORWARD THIS BLOG TO PEOPLE YOU THINK WANT THE PATIENT-CENTERED REVOLUTION TO SPEED UP. Political scientists studying interest group politics often start with an assumption that the “top of the food chain” in interest group politics has to be the Ontario Medical Association. The initial assumption is that this rich and powerful lobby group runs circles around the government. However, the actual record over the past twenty years indicates that the OMA does not have a “winning track record” in their relations with government. The truth is doctors tend to be politically naive about the cut and thrust of political dynamics. To start with, physicians are not even aligned as a group. So it has been hard for the OMA to be the “single voice of doctors”, when they are often fragmented. The problem is: we will never successfully transform our healthcare system, until and unless our doctors are happy. Nevertheless, it is hard to generate any sympathy for physicians among the other healthcare interest groups. Indeed, there have been a number of cases where government has gained the “upper hand” when the Ontario Hospital Association has publically opposed the OMA — and urged the government to undertake measures the doctors oppose. While we’ve had many examples of “divide & conquer” politics among healthcare interest groups, these incidents become embedded in our culture, and in weakening relationships. If our goal is to transform the system, we need these vested interest groups to collaborate and partner with one another. However, the challenge — following the expected election this Spring or next Fall — will be transforming our healthcare delivery system, with fewer financial resources. Because our doctors are very well paid following the significant increases they negotiated with the McGuinty Government, the assumption is: they are the “big winners” in the resource allocation game. Most people remember the series of generous increases over the past 10 years — forgetting the virtual wage freeze that lasted for much of the ’90’s. In the last set of negotiations, the result — on average — was that most doctors have experienced at least a 5% reduction in their income. It could have been, and still might get worse, once the election has been settled. The top strategist for the OMA today is former Deputy Minister of MOHLTC, Ron Sapsford. While Ron certainly sees the “big picture” from his comprehensive perspective, his mandate is to represent the narrow interests of the doctors — who have experienced higher than average wage increases for over a decade, but who still feel undervalued, unfairly treated, and poorly paid. Indeed, “physician unhappiness” has become a major impediment to healthcare transformation throughout our healthcare system. “What are we going to do about our grumpy doctors”, is all too common a question/concern expressed right across the province. We talk about the need to be honest and open with patients about tough issues like end-of-life planning. Well, we also need to talk to our doctors about what’s at stake over the next few years for the very survival of our public healthcare system. The system cannot be successfully transformed without the full involvement of physicians in the design, planning and implementation phases of health system transformation. What we know from past experience is that “more money” does not make physicians happy. We’ve tried significant annual increases every year for the past ten years, and it does not work. More money has never solved our “physician unhappiness” problems. Given that the government does not have any more money anyway, perhaps now is the time to address the underlying reasons for such widespread grumpiness on the part of the medical profession. As everyone on the ground-floor of healthcare service delivery knows, physician behavior and attitude has a huge impact on both the quality of health service delivery, and on the level of job satisfaction for the rest of the health services team. We need “happy doctors” to produce an environment where the whole healthcare team can collaborate to achieve the great care, and good service, that taxpayers believe they have already paid for over many years. As the system transforms over the next three to five years, nurses and other health professions will no doubt see jobs shift to the community sector — perhaps at lower pay. Physicians ought to understand that rather than “more money” for OHIP fees, we really need to save as many RN and allied health care jobs as possible. How about some empathy from physicians for our non-medical health professionals! Our anxiety-ridden service delivery system really can’t afford to have the OMA and the government at logger heads again over money for increased physician payments — we know how that nasty fight ends. It won’t be pretty. Given that there is no money, can we stop the mean spiritedness, and switch to the “Happiness Agenda” for doctors; to the “Better Experience & Quality Agenda” for patients; and to the Determinants Of Health & Equity Agenda for the high-cost, at-risk populations? The fact is, we need physician brain-power fully engaged in the on-going design and planning of our local health service delivery systems, at the Health Link operations level; and at the LHIN planning level; and, at the provincial policy level. We will never run a good healthcare system without meaningful physician engagement in the overall planning operations and policy process. We need physician brainpower — and we need positive and collaborative attitudes. In recent years, the OMA has invested in a rigorous leadership development program which is beginning to produce a new generation of physician leaders at the local health care service delivery level. As the Health Links are being set up, there are numerous examples of young, smart doctors taking an active role in shaping our primary care system. Dr. Jonathan Kerr of Belleville Ontario, is one such emerging community physician leader who graduated from the OMA’s leadership development program. The South East LHIN brought Jonathan on as their Primary Care Physician Lead. “He has got great listening skills and he builds trust and commitment among each of the people he works with”, says one observer. Dr. Brent Elsey with the Barrie Family Health Team is another “next generation physician leader” who is really exciting physicians and connecting to everyone on teams throughout the North Simcoe Muskoka LHIN about the benefits of more integrated approaches to primary care. In the Central West LHIN, Dr. Frank Martino is the Primary Care Lead. He is the current President of the Ontario College of Family Physicians. Observers say Frank is another “emerging physician leader” who really connects with other physicians — as well as with everyone else on the multidisciplinary partner’s team. While the next generation is “getting ready” to provide enlightened and visionary local leadership for primary care reform and health system transformation, physicians as a group are too often chronically unhappy. But poking sticks at them in the fee negotiations is not a particularly smart strategy. Engagement and meaningful involvement is the very best strategy. The challenge is the “level of cynicism” that exists on both sides. While everyone pays attention to the issue of physician incomes, the fact is organized medicine invests considerable efforts to improve health, and improve the healthcare system. Doctors have to work in this system, so they want to make it better too. Currently the OMA is working closely with the Ontario Quality Council to develop quality-based procedures. They are active partners on the “Choosing Wisely Campaign” which encourages physicians to think about the value of tests which are of lower value, or, perhaps unnecessary for some patients — potentially saving hundreds of millions of dollars. The OMA is also placing priority on the electronic medical records with their aggressive e-agenda — which has now resulted in over 9,000 physicians with electronic records. If we’re looking for insights that will determine the design of Ontario’s emerging system, the OMA certainly has compelling insights that must be considered when primary care — rather than acute care — is the centre of the system. While it is true that many physicians still demand no further reductions in income, the fact is that many understand the province’s financial realities and are supporting the OMA to help create a better health system for everyone. Hopefully the OMA Board and Council will be able to convince rank-and-file physicians that it is in their very best medium and long-term interests to help create a better healthcare delivery system — rather than just fight for an even richer pay packet for doctors — which can only end in what economists call, “The Tragedy Of The Commons“. The “Tragedy of the Commons” is a systems thinking archetype that illustrates one of the common mistakes in designing complex adaptive systems: combining perverse incentives for individuals or silos in systems — where system health and survival actually requires cooperation and coordination of effort. The archetype is named after an essay by ecologist Garret Hardin that explains how a tragedy occurs over the use of a “common pasture” — where the villagers of a community graze their livestock, and where the incentive structure is designed to reward everyone for increasing the size of their livestock herds. In such environments, greed is the normal response. Over time, the common pasture is bare dirt, all the livestock die, and the villagers starve-to-death. That’s what we are heading for right now in Ontario: another “Tragedy Of The Commons“. Prime Minister Paul Martin Jr’s $40 billion, 10-year, 6 percent annual increases “Fixed-For-A-Generation Health Sector Reform Fund”, was almost all spent on wage increases for healthcare professionals. While some of the money went to improved services, most went to improved wages for healthcare professionals. The Canadian Institute For Health Information reports that half of the money from the six percent annual increases went to physician fee increases — which went up an average of 3.6 percent each year, for ten years. Unionized nurses and hospital staff improved their wages by an average of 3.4 percent per year — “way better” than anyone else did over that same period. So all that money — which was to be spent on changes that would “fix healthcare for a generation” — just turned into greatly improved wages and gold-plated pensions for health professionals. Not higher quality services. Not services that are more “patient-centred”, or even “safer” care. Just better wages and pensions. Now we’re broke, and the healthcare system still needs to be “fixed“! Let’s hope that our doctors roll up their sleeves and press on with the work they have started — and let’s hope that government and the delivery system meaningfully engages our doctors in efforts to truly transform our healthcare services delivery system. Next week I’ll address the emerging Patients’ Lobby. FORWARD THIS BLOG TO PEOPLE YOU THINK WANT TO BUILD POSITIVE RELATIONSHIPS WITH PHYSICIANS AND ORGANIZED MEDICINE. Over at the headquarters of the Registered Nurses’ Association Of Ontario (RNAO) on Pearl Street, a counter-strategy is evolving about how to deliver primary care and support services to meet the needs of our population with evidenced-based best practices. Their process includes looking at the evolving system through a lens that enables the full scope-of-practice of RNs, while also expanding the use of Nurse Practitioner-led Clinics and exploring concepts like the “Care Co-ordinators” in the delivery of primary care services. Over the past five years, the RNAO has conducted a number of very effective and influential advocacy campaigns for health system reform on such vital issues as primary care, air quality, health promotion and the transformation and expansion of community care services. All of these advocacy campaigns reflect the heart-felt values of their nurse members. They have produced some top-notch, values-based, leading-edge public policy and nursing practice guidelines in their published reports: “Client-Centred Care”, “Facilitating Client-Centred Learning” and “Strategies To Support Self-Management In Chronic Conditions”. These paradigm-shifting perspectives — all presented with compelling, solid evidence — are now starting to have an impact on the thinking of a number of key people/groups in the healthcare sector. For their part, the RNAO argues that much of our CCAC costs are for “unnecessary bureaucracy”. They suggest relocating the Case Managers to primary care settings to save what they say is $160M annually in administration costs. While more streamlined administrative costs is one part of the RNAO’s goal, they say they are primarily focused on quality patient care, and evidence-based best practices. Over 150 RNAO members will descend on Queen’s Park on February 27th for their annual Nurses’ Lobby Day. Nurses are now advocating for their three-year plan, Enhancing Community Care for Ontarians (ECCO) which proposes that interprofessional primary care organizations — such as Community Health Centres (CHC), Nurse Practitioner-led clinics (NPLC), Aboriginal Health Access Centres (AHAC) and Family Health Teams (FHT) — expand their reach and role over the next three years, with the support of a temporary LHIN-led Primary Care Transitional Secretariat to organize local geographic primary care networks. The RNAO’s ECCO model proposes that by 2015, primary care organizations should provide complete care co-ordination and health system navigation for all Ontarians — including the referral for home health care and support services, thus eliminating the need for CCACs. Current Registered Nurse (RN) case managers and care co-ordinators working within CCACs, would transition to the primary care setting and contribute their high level of expertise and system knowledge to provide dedicated care co-ordination and health system navigation to Ontarians with the most complex care needs. The remaining population will receive care co-ordination from a combination of existing primary care RNs, non-RN case managers/care co-ordinators and other qualified primary care providers. So, by the end of Nurses’ Lobby Day, most MPPs will have had a quality one-on-one conversation with a passionate and articulate RN (from their riding) who will explain how the RNAO’s ECCO model benefits patients. 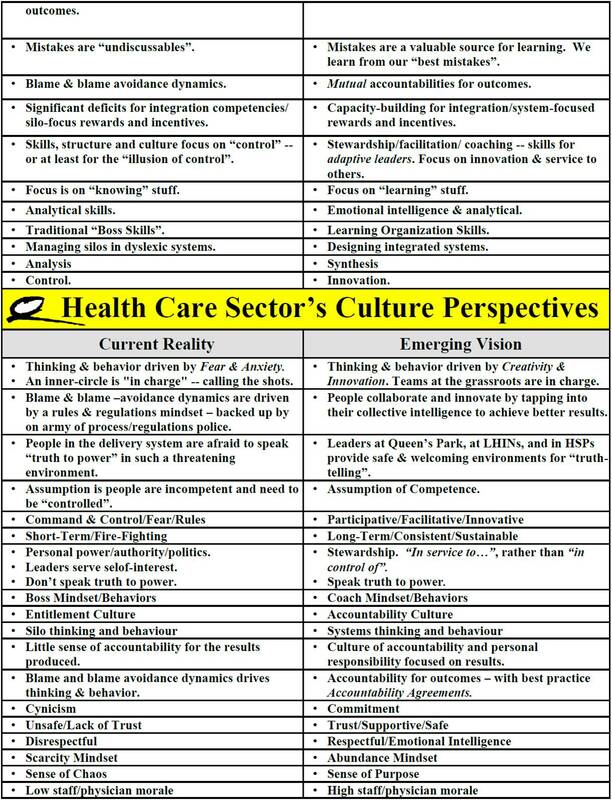 Having worked with nurses on strategy and operational issues for the past 20 years in the Balanced Scorecard development process with hospitals and CCACs, I think I have a fairly good understanding of their values, beliefs and passions. Today, RNAO really does reflect their rank-and-file members. That’s why they have grown from 17,728 members in 2002, to 36,000 voluntary members by 2013 — an increase of 103 percent. So, here is an organization with remarkable staff and board leadership. Even if you don’t like them because they are mostly focused on the nurses’ perspective, these guys really have learned how to be effective in our complex political/policy environment. They do something very important: they speak “truth to power” and, as a result, they have real influence on how decision-makers think about the key healthcare issues. Feisty RNAO CEO Doris Grinspun — who along with her President and thousands of engaged members of RNAO speak out passionately on behalf of the nursing profession. Indeed, Grinspun has become a major force for evidence-based health policy and for best practice reform initiatives that would truly benefit patients — while at the same time — enhancing the full scope-of-practice of RNs. She tells it like it is — the whole truth. As a result, all three political parties listen respectfully to Doris, and to the RNAO’s message. Other groups are critical of the RNAO’s razor focus on just nurses — rather than on the whole healthcare team. However, most are very aware of the rising influence of nurses. The hard, cold, political fact is that our three provincial party leaders want to reach out to this significant voting block of 115,000 Ontario RNs and their families. So they listen carefully to Doris because she is a passionate, values-focused advocate who can, and will, mobilize these nurses politically. As we witness the traditional “dances of the dinosaurs” with hospitals and doctors, another very entrepreneurial and highly strategic force for progressive health policy reforms has been unleashed by the Ontario Association Of Community Health Centres, under the leadership of Adrianna Tetley, their hard-working, highly-strategic, bottom-line CEO. Originally set up under Bill Davis’ “Red Tories”, Community Health Centres had an initial mandate to serve “at risk” populations — particularly the poor. However, the holistic, more integrated approach to primary care was seen as the model that would ultimately emerge as a focal point for primary care service delivery, while grand-fathering many of the solo GPs over however many decades it would take. The long-term plan in the early ’80’s was to incrementally grow the CHC sector, and to measure its performance for gradual expansion into middle class communities. Thirty years later, we still only have 77 CHCs serving just 4 percent of the population. That’s because McGuinty and the OMA favored Family Health Teams to CHCs. Tetley has the good fortune of representing a sector that produces excellent health outcomes — in a fairly cost-effective manner. The CHC sector ought to have a bright future because of their high patient/client satisfaction rates — which are directly related to their fully-integrated, multidisciplinary team approach to holistic primary healthcare services. AOHC places a lot of emphasis on building the internal capacity of CHCs to be excellent at quality, service and the patient/client experience. As a result, today there are many more examples of administrative excellence and high quality healthcare services — along with compassion, caring, commitment and love. Recent studies by the Institute For Clinical Evaluative Studies (ICES) demonstrated that the CHC Primary Care Model is by far the best performer among all of the other primary care models. They even take the sickest — 32 percent of CHC clients have multiple diagnosis. Another study by Elisabeth Bruyère Institute, found that CHC model provides “superior services in chronic disease prevention and management, as well as superior health promotion services”. Hello? Isn’t that what we will need more of in the future? In terms of health system transformation, if primary care is to become the “hub of the system“, CHCs need to be a key strategic sub-sector that ought to grow by at least 8 percent per year for the next three years — to achieve at least 24 percent growth (prior to reducing hospital budgets) as the government makes good on their commitment to “shift resources to primary care, and to the community sector”. This “parallel system” would only co-exist for a short two to three-year transition period. That means that health system operating costs will be much more expensive in the initial set-up, and start-up phases of transformation. For a brief period, we would have both the developing community sector, and the hospitals (frozen at “0”), in full operation — until the appropriate community services are fully in place — and only then reducing the institutional budgets within each community’s Integrated Health Service Plan. However, the realities of minority government — now, and after the next election — means that nobody is actually planning the “transformation” in any sort of strategic way. Yes, that’s right. There is no plan. Surprise! Welcome to Ontario. We don’t have a plan for the future. I told you, people with weak stomachs need to avoid observing two things: the making of sausage, and the making of public policy — because there is a lot of crap in both those products. So the government mostly just “talks” transformation policy — and sincerely hopes for it to occur one day — while maintaining as much of the status quo as possible, for now. When you are in a minority government situation, its smart politics to be on both sides of the Status Quo/Fundamental Transformation debate. Nevertheless, beyond the “politics of survival” for the Spring Budget 2014, is the whole ugly truth about the province’s true economic circumstances — and the realities of both pending funding cutbacks, and the pressing need for the reallocation of resources between the institutional and community sectors. In the meantime, the OACCAC in its fourth policy paper, “launching the conversation”, has suggested that the government contract out their policy responsibility to a Commission or “Committee Of Experts” who would report after the election — so the current government can say: “It is being studied”. But that won’t work. In the next election, voters will want to know from each political party: Do you support user fees, and means-tested private pay for home care services, or not? And, if not, how do you propose to pay for expanded homecare services: by reducing some of the estimated 30% waste in our $48 billion system; by shifting resources from acute care services to home and community support services, or by some combination of these? Next week I’ll tell all about the Doctor’s Lobby.